Welcome to Arbor Hills Dental Care and thank you for your interest in our office. We understand what a difference a healthy and a beautiful smile can make in your life. We also understand that you have many choices for your dental care. That is why our goal is to provide you and your loved ones with dental experiences and results that surpass your expectations. From our highly skilled team of doctors and staff, to the techniques and materials we use, and to the award-winning design of our facility, our mission is to provide comfortable, state-of-the-art, minimally invasive and personalized dental care in a gentle and relaxing environment. The husband and wife team of Drs. Theodore and Samantha Cho will always strive to ensure your safety and comfort and provide you and your loved ones with the care necessary to rejuvenate, restore, and maintain a healthy smile for a lifetime. We are conveniently located in Vernon Hills and near Buffalo Grove, Lake Forest, Libertyville, Lincolnshire and Mundelein. New patients are always welcome! 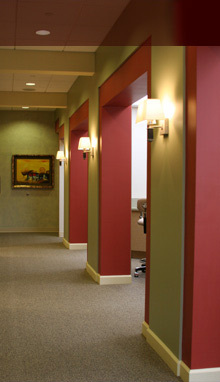 To schedule an appointment or a tour of our office in Vernon Hills, call today at (847) 955-9500.